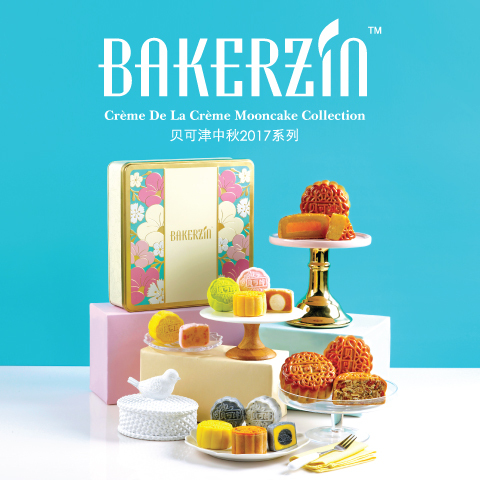 Monday | August 7, 2017	Come this Mid-Autumn, be enchanted with Bakerzin Crème de la Crème Mooncake Collection! Enthralled with the new and limited edition of Bold Collection, only 500 boxes whilst stocks last, containing four new luxuriant flavours, American Ginseng, Ginger, Sakura Ebi and Tom Yum Baked Skin Mooncakes! Salivate in the comeback of our reigning champion, the durian mooncakes from the Majestic Collection, one that is synonymous with all durian lovers alike! Be frenzied with beautiful and colourful pastel mooncakes, from the Prestige Collection and Pure Divine Collection, each of alcoholic and fruity flavours respectively. ‘Coconut’ trend is back this year, so look forward to Coconut Liqueur, we are sure this will mesmerize you. Continuing the trend, pick the Heavenly Collection containing Black Sesame Coconut Egg Custard, or the pure Black Sesame flavour, both will make you fall in love with Bakerzin mooncakes all over again! The other flavours are Black Sesame Butterscotch and Black Sesame Peanut Butter, the former is sheer delight and the latter sends you on a guilt trip, forget about the diet plans! Prepare to gift to business associates and family with Bakerzin’s evergreen classic that will never run out of style, the Signature and Premium Collection, both containing the Premium Egg Yolk Blend Mooncakes. All mooncakes will be available for pre-orders from 7 August 2017 onwards at all Bakerzin outlets and www.bakerzin.com. National Day Special - 52% off Mooncakes pre-orders from 7 to 9 August. Be the first to grab this irresistible deal, here's a one-time 52% off Mooncake* discount coupon for you. Download the above coupon now and claim in-store from 7 to 9 August 2017! For more information and custom-made corporate orders, kindly email to corporatesales@bakerzin.com or call +65 455-8885.